8/8 Cup of Coffee: Thursday saw some excellent starting pitching down on the farm, though unfortunately much of it went for naught. No starter allowed more than two earned runs on the day, but only Jacob Dahlstrand (pictured) got credit for a win. 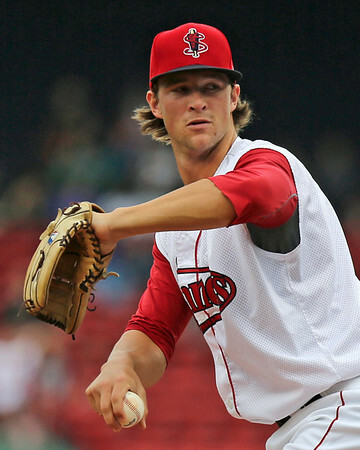 Pawtucket and the GCL Red Sox had comeback wins, while Lowell walked off with the victory. Greenville fell in extra innings, the DSL Red Sox lost a pitchers duel, and Portland failed to hold its early lead. The PawSox were able to come out on top of this back-and-forth contest, scoring three in the seventh and four in the eighth. Steven Wright made his return after a quick major league cameo, and was victimized by a trio of errors behind him. Overall only one of the four runs he allowed was earned in six innings. He gave up six hits and walked three while striking out two. Alex Wilson allowed a two-run homer in his only inning of work, but got credit for the win when the PawSox offense exploded for four runs in the top of the eighth. Dalier Hinojosa and Ryan Verdugo each struck out two while throwing a scoreless inning apiece. Ryan Lavarnway restarted his rehab assignment by going 3 for 5 with a double and two RBI. Lavarnway now has a seven-game hit streak at the Triple-A level that extends back to May 22 and has withstood a promotion to Boston and two rehab assignments. Alex Hassan was 3 for 4 with a walk for Pawtucket, and Travis Shaw ripped a pair of doubles in the win. Mookie Betts rejoined the team, going 1 for 4 with a walk, a run, and two RBI. Justin Haley made his second consecutive strong start since his promotion from Salem. The right-hander threw six shutout innings, allowing only three hits. He struggled some with his control, walking five and hitting a batter, but he was able to pitch around those issues with the help of four strikeouts. Bowie did all of its scoring in the seventh. Pete Ruiz, who came in having allowed only four runs in 20 1/3 innings, gave up five without retiring a batter. Ruiz allowed four hits and a walk, taking his first loss of the season. Ryan Dent led the way at the plate, going 2 for 4 with a double and his first home run since moving up to Portland. Dent now has four homers across two levels, his highest total since the 2010 season. The victory for Salem comes on the strength of a career-best outing for Jacob Dahlstrand. The right-handed swingman allowed a pair of unearned runs in the first, and followed that with six straight scoreless frames. Dahlstrand had separate streaks of seven and eight consecutive batters retired. Overall he scattered four hits across seven innings, striking out four and walking two. Dahlstrand was actually on the hook for the loss when he left the game, as Salem trailed 2-1 heading into the bottom of the seventh. However a Matty Johnson base hit tied the score, and Carlos Asuaje broke the tie with a three-run blast. It was Asuaje's second since his mid-July promotion and 13th on the season. Kyle Kraus pitched two shutout innings for the save, allowing one hit and striking out three. Jantzen Witte was 2 for 3 with a triple, and Aneury Tavarez had a double as part of his two-hit night. A pitchers duel turned into a tough loss for the Drive. After matching zeroes for seven innings, Greenville took a 1-0 lead when Sam Travis scored on a throwing error following a base hit by Kevin Mager. Lexington got the run back in the bottom of the inning and then walked off with the victory in the 10th. Travis continues to have his way with South Atlantic League pitching, going 2 for 4 on the night. He has hit in all six games since his promotion, going 11 for 23. Across two levels, Travis has now reached safely in 30 straight games. Starter Teddy Stankiewicz was outstanding despite not factoring into the decision. The 2013 second-round pick gave up only three hits in six shutout innings, striking out three and walking one. German Taveras gave up an unearned run in his three innings of work, and the winning run came in off of Raynel Velette who fell to 6-3 on the year. Lowell was on the other end of a walk-off, escaping with the victory at LeLacheur Park. Mauricio Dubon led off the inning by reaching on an error, and advanced to second on Nick Moore's sacrifice bunt. Dubon then raced home with the winning run on a Deiner Lopez base hit. It was the third hit of the night for Lopez, who drove in two of the Spinners runs and scored the third. Danny Mars was 1 for 3 with a walk and stolen base, extending his hitting streak to six games. Joseph Monge and David Sopilka chipped in a double apiece in the win. Heri Quevedo got the start, allowing two runs on four hits in six innings. He struck out four and walked two. Chandler Shepard earned the victory, firing three scoreless innings, giving up only one hit and striking out a pair without issuing a walk. After a somewhat rocky start to his pro career, Shepard has now allowed only one run in nine innings over his last four outings. Four of the Red Sox 10 hits went for extra bases and the team added five walks in their relentless assault on Rays pitching. Rafael Devers led the charge, blasting a sixth-inning grand slam as part of a 2-for-5 afternoon. Devers now has seven homers and a .551 slugging percentage across two levels in his professional debut. Luis Alexander Basabe, who was Devers' teammate in the DSL to start the season, also went deep with a three-run fifth-inning blast. It was Basabe's first home run since coming stateside, as the right fielder also walked and scored a pair. Alex McKeon and Trenton Kemp both doubled as part of matching 2-for-4 performances. On the mound, Gabe Speier continues to impress in his return from Tommy John surgery. The 19-year-old righty allowed just one unearned run on two hits across four innings, striking out three without issuing a walk. Across six appearances, Speier has given up just two earned runs in 16 innings, featuring an impressive 11 strikeouts against only one walk. Yankory Pimentel fired three scoreless innings to earn the win in relief. Enmanuel De Jesus was on the wrong end of a tough pitchers duel. De Jesus gave up only one unearned run on three hits in six innings. He struck out three and walked two, taking the tough-luck loss. The six-innings marked a career high for the 17-year-old left-hander signed out of Venezuela. Darwinzon Hernandez tossed three scoreless innings to keep the game close, but there would be no comeback out of the Red Sox offense. None of the team's seven hits went for extra bases, and they were 0 for 5 with runners in scoring position. Luis Alejandro Basabe was 1 for 3 with a walk and a pair of stolen bases. Player of the Day: It was a day with a number of worthy performances, particularly on the mound. Jacob Dahlstrand gets the recognition due to leading Salem with one of the best outings of his career. In his fifth season with the organization, the 6-foot-5 righty went seven full innings for just the second time, and both runs he allowed were unearned. Dahsltrand has quietly had a workman-like season in 2014. In 87 1/3 innings between Greenville and Salem, he has a 2.58 ERA and 63 strikeouts against only 26 walks.